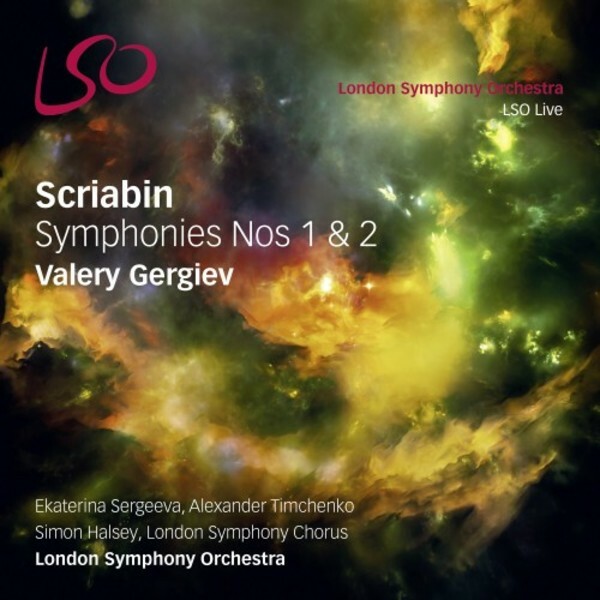 Valery Gergiev and the London Symphony Orchestra bring to a close their revelatory Scriabin cycle with the release of Symphonies 1 & 2. Premiered two years after Symphony No.1, the Second Symphony contains echoes of Strauss, Tchaikovsky and Wagner, alongside Scriabin�s own deeply personal sound. While relatively more restrained in style than Scriabin�s other symphonic output, over the course of its five movements there are sweeping climaxes, swirling colours and passages of majestic intensity. Ekaterina Sergeeva has been a soloist with the Mariinsky Academy of Young Singers since 2005. She appeared as Elektra�s Trainbearer, on the LSO Live recording of Elektra with Valery Gergiev and the London Symphony Orchestra. Tenor Alexander Timchenko performed the role of Shepherd in Stravinsky's Oedipus Rex with Valery Gergiev and the LSO in 2012, and also Stravinsky, Les Noces, with the Mariinsky Orchestra & Chorus.